An Ultimate level Legend-Arms shield Digimon, its entire body is composed of shields and has taken the form of a dragon. By attaining the data of "legendary shields" from legends and video games, it evolved to become a shield boasting absolute hardness, one that cannot be scratched by any attack. While appearance-wise it seems to be made from Red Digizoid, the true extent of its hardness cannot be analysed. Bryweludramon has two standalone AI units, Gause and Fay, which allow it to see in all directions. Gause and Fay also possess barriers made from flames, and are able to extend the scope of their barriers to cover even Bryweludramon. Because Gause and Fay are capable of acting independently of Bryweludramon, no matter how far-separated they are, it is said that they are even capable of covering the entire world with their barriers. Although Bryweludramon may be the strongest shield, it seems that its barriers have been broken and bested before by its nemesis Durandamon. 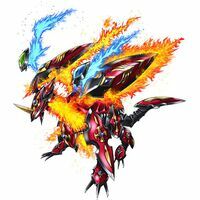 Its Special Move is unleashing a blaze from its flaming wings (Guren Storm), and detaching its wings, shrouding it in a barrier of flame as it charges towards the enemy (Blast Smash). However, transformation is the most valuable asset of a Legend-Arms; should one wield Bryweludramon while it is transformed into a shield, no enemy would be willing to keep up their assault. Ludomon's ultimate form! Data Attribute and Armor Type. From minor corruption of Prydwen (King Arthur's shield). From Shīrudo 「シールド」, a Japanese romanization of 'shield'. Guren Storm  Crimson Storm グレンストーム Guren Sutōmu Unleashes a blaze from its flaming wings. 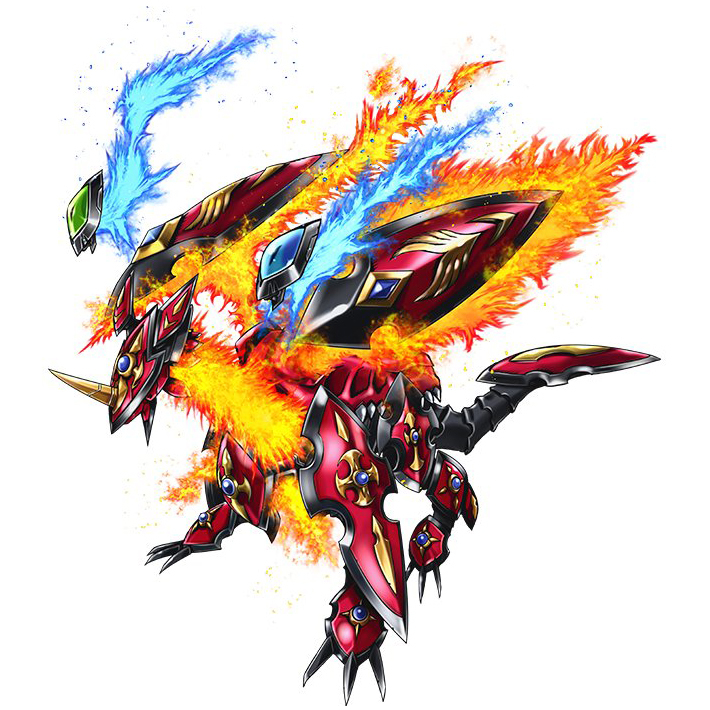 ブラストスマッシュ Burasuto Sumasshu Detaches its wings, shrouding itself in a barrier of flame as it charges towards the enemy.